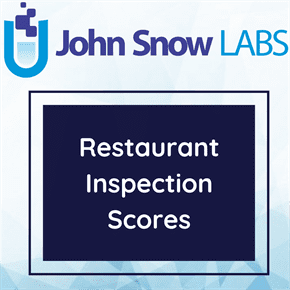 This dataset provides restaurant scores for inspections performed by the Health Department in King County, from 2006 to the present. It includes the name, location and address of the restaurants. This dataset is organized by business / inspection date / violation. Each row in this dataset is an inspection, and if an inspection at a particular business results in multiple violations there will be multiple rows for that business with the same inspection serial number. Food establishments that sell or serve food to the public must get an annual permit and be inspected by Public Health – King County. These establishments include restaurants, food and espresso carts, coffee places, delis, the fresh food sections in grocery stores, temporary events where food is sold, and more. There are about 11,000 permitted food service establishments in King County. The majority of these establishments have two unannounced inspections per year. While many of these food service establishments will automatically receive one special educational session on food safety annually, any restaurant may request a special educational session. The purpose of the inspections is to assure that the food is being handled properly from preparation through serving. Inspectors observe kitchen workers’ food handling practices, assure equipment is working properly, take food temperatures, inspect refrigerators and storage areas, assure water temperatures, and correct level and use of sanitizers. Any problem found is written up, and the manager is taught the correct procedure or method immediately. There are two types of violations recorded on the inspection report: Red and Blue violations. Blue critical violations are primarily maintenance and sanitation issues that are not likely to be the cause of a food-borne illness. Each violation has a numerical value based on its risk of food-borne illness. Therefore, there are more points given for red critical violations than for blue violations. Whenever possible, violations found during the inspection are corrected immediately. Red critical items found during the inspection must be corrected immediately. Examples would be re-heating a food to 165° F, putting it into the refrigerator or discarding the food.